Den turkiska historiska institutionens ordförande, Yusuf Halacoglu har sparkats från sin post. Halacoglu satt på sin post i 15 år och har drivit statens officiella linje som gick ut på att förneka folkmordet på assyrier/syrianer, armenier och pontus-greker. On Sunday, July 6 2008, approximately 100 people from all over the world participated in the climb of the Rigi mountain in Switzerland. 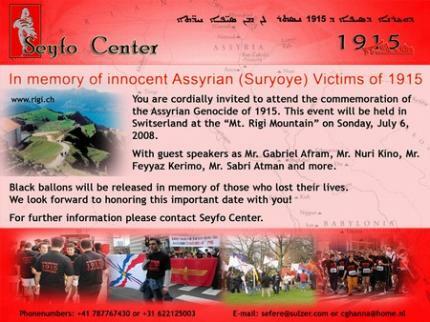 The climb was marked by the commemoration of the victims during the Assyrian Genocide of 1915. On top of the mountain there were symbolically a large number of black balloons released with the text: 'Turkey should recognize the Assyrian Genocide'. The Assyrian Universal Alliance-Australia Chapter together with the Australian Institute for Holocaust and Genocide Studies are hosting a Seminar commemorating the Assyrian Martyrs and Genocide Day on 7 August 2008.